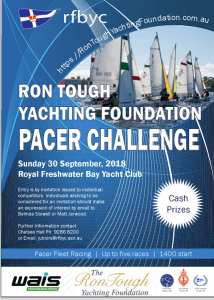 A gusty 10 to 15 knots greeted 58 of Western Australia’s best young sailors as they prepared for the Inaugural 2018 Ron Tough Yachting Foundation Pacer Racing Challenge. 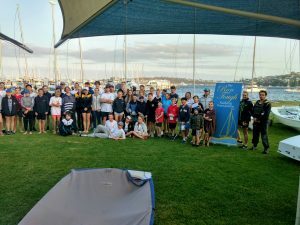 With huge assistance from Royal Freshwater Bay Yacht Club as the host club 29 Pacer boats had been prepared. 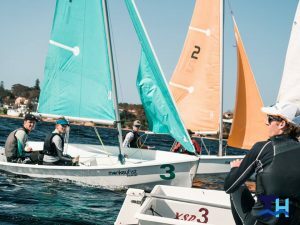 The coaches from the Western Australian Institute of Sport had paired up the skippers and crews to equalise weights and maximise learning opportunities, and it was nearly time to race..
Race Officer Kim Laurence and his start team ran precision operation to complete the full five race program. 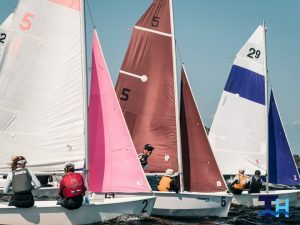 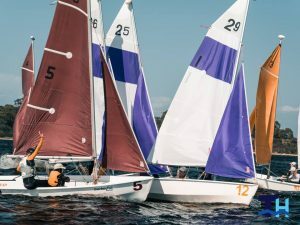 With a light patch near the top mark and a little tide the top mark rounding taught a lot of harsh lessons and the Coaches who doubled as Umpires for the Appendix Q Umpired Fleet Racing were kept busy. 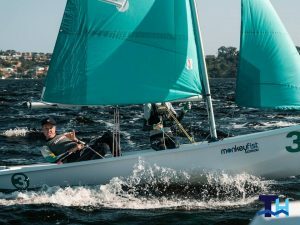 The only boat that managed two wins was our homegrown Laser legend Matt Wearn (it was his birthday! 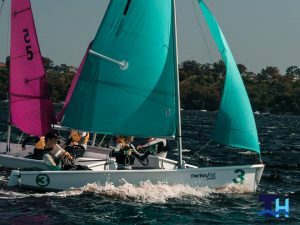 ), but the racing was so close that even with two wins Matt and his Crew Adam Hindmarsh could only manage 6th overall after the five races were finished. 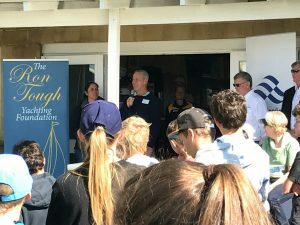 After Race presentations were accompanied by a sausage sizzle cooked by the Directors of The Ron Tough Yachting Foundation to feed all the hungry sailors and volunteers. 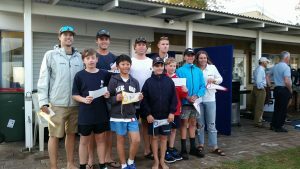 The Winner of the day was our Finn Olympic hopeful Richard Maher and crew Giacomo Helliar, with Laser Radial sailor Zoe Thompson and Will Drew in second overall, and 2018 Ron Tough Scholarship recipient and 49er sailor Lachy Gilmour sailing with Aaron Teo taking out 3rd overall. 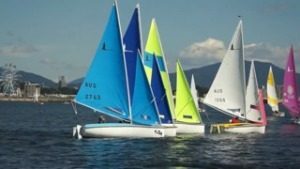 Full results can be viewed at RTYF Pacer Results. 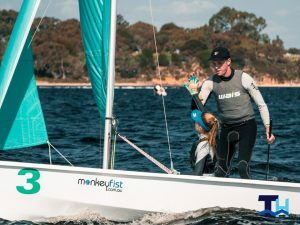 The opportunity to bring our states best sailors together so they can practice big fleet starts and strategy together was the brainchild of WAIS Head Coach Belinda Stowell-Brett and it gives an immensely valuable opportunity for our younger aspiring sailors to sail with, and learn from, some of the young legends of our sport. 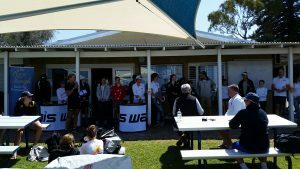 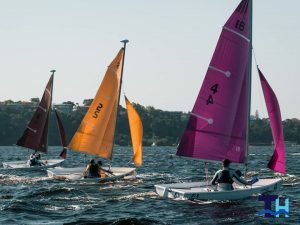 It is an Honour for the Ron Tough Yachting Foundation to have provided resourcing and coordination to help WAIS, the states best coaches from each of the clubs, and Royal Freshwater Bay Yacht Club in bringing this wonderful event together. 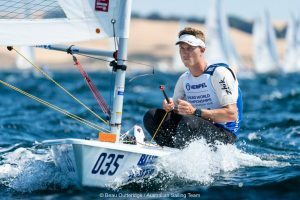 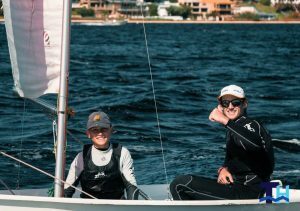 The quality of the event, and exuberant involvement of our young sailors, is a great credit to the Western Australian Sailing Community. 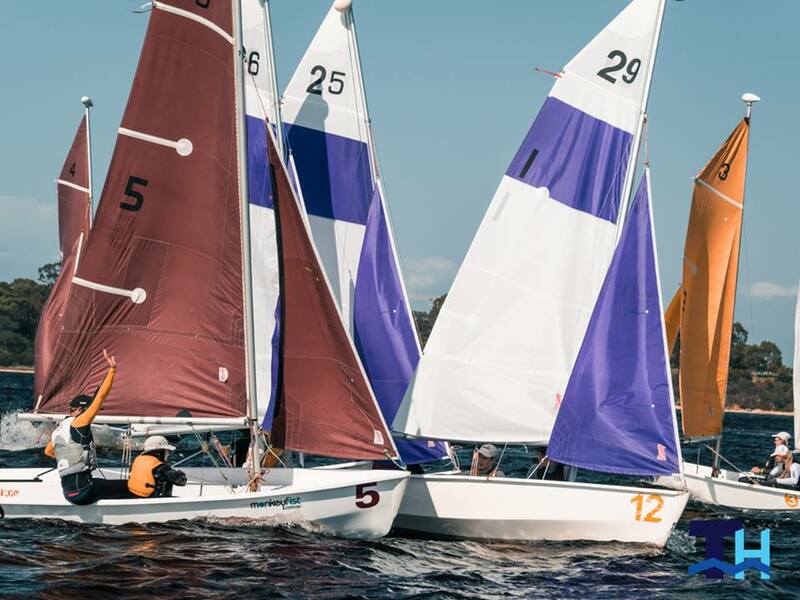 Thanks to Tom Hodge for the great pictures. 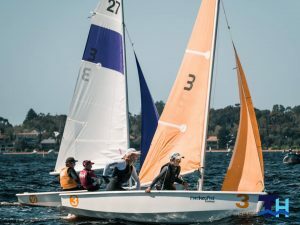 His knee injury may be stopping him from sailing, but it is great to have him on the water assisting and taking such great shots!